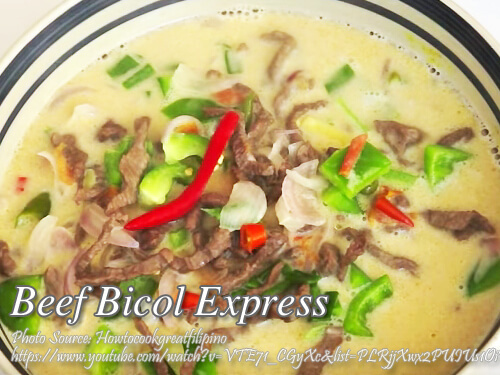 This Bicol express version uses beef instead of the usual pork in cooking this dish. Compared to pork, beef is more healthy and if you abstain from pork, then I think this is the time you will have chance of eating Bicol express. The reason why it is called Bicol express is because it is a very spicy dish and your mouth will burn and smoke like a choo choo train, just figuratively speaking. You can also use other chili peppers if siling labuyo is hard to find. With regards to the consistency, some people wants a very thick sauce while other like a saucy dish. You can adjust the water when cooking this dish according to your preference. To cook beef bicol express; In a medium size wok, heat oil and saute the beef until slightly brown. Pour 1/2 cup of water and let it boil. Stir then add the ginger, black pepper, tomatoes and siling labuyo. Stir for a few minutes then add about 1 cup water. Add more if necessary. Cover and simmer the beef until tender and the liquid has evaporated to half. Then add onions, bay leaves, patis and coconut milk. Mix the ingredients and simmer again for 30 minutes. Then add the sweet pepper and spring onions. Simmer for a few seconds then serve. In a medium size wok, heat oil and saute the beef until slightly brown. Pour ½ cup of water and let it boil. Stir then add the ginger, black pepper, tomatoes and siling labuyo. Stir for a few minutes then add about 1 cup water. Add more if necessary. Cover and simmer the beef until tender and the liquid has evaporated to half. Then add onions, bay leaves, patis and coconut milk. Mix the ingredients and simmer again for 30 minutes. Then add the sweet pepper and spring onions. Simmer for a few seconds then serve.